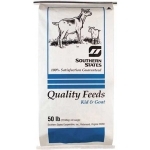 Keep your herd healthy and energized with Southern States 18% Goat Feed (Deccox) Medicated. 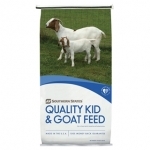 This medicated pelleted complete feed is great for growing or mature goats and assists in the prevention of coccidiosis in young goats. Southern States 18% Goat Feed (Deccox) Medicated is a high-protein, high-energy mixture fortified with vitamins and minerals intended to help balance a diet of hay and pasture forage. Please contact the store for pricing. Please contact the store for pricing.